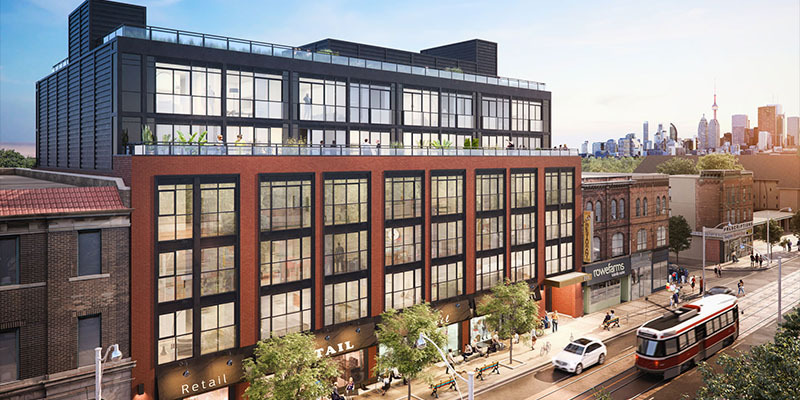 Introducing The Logan Residences – a new boutique residence in the heart of Toronto’s desirable Leslieville neighbourhood. The building is tastefully designed to keep it in line with its surroundings and there will be retail space on the ground floor to add to the impressive range of stores and local businesses in the area. Logan residences is a small, boutique building with only 69 units in total plus an interesting set of amenities that includes a rooftop gardening area that will be available to residents who are looking to grow their own vegetables. Details of suite sizes and layouts have not been released yet but we expect details soon. Register with us today to ensure that you get updates on the development as soon as they are released. The Logan Residences is located on Queen Street East, just a short distance west of the junction with Carlaw Avenue. The area is full of life, with local artisan shops, great restaurants and cafes and a great array of small businesses looking to serve the community. There are parks and a recreation centre just a short walk away and the lakeshore area is also easy to reach, with Ashbridges Bay Park and the sandy shores of the Beaches neighbourhood as little as seven minutes away. Heading west, downtown Toronto can be reached in 15 minutes on transit – adding to the near endless options for of The Logan Residences. Perhaps the best feature of transit at The Logan Residences is the 24-hour Queen streetcar which stops just steps from the building. At peak times, that service runs every four minutes, so you won’t have to wait long to get where you’re going. That explains the high transit score of 95/100, which means this area is almost perfect when it comes to public transport. It’s pretty good for motorists as well because there is an entrance ramp to the Don Valley Parkway just a four-minute drive away and it won’t take you much longer to get onto the Gardiner Expressway. If you want to ditch motorized transport and ride a bike, you’ve also got lots of options. The bike score of 92/100 shows that this is a great area for cyclists, with many dedicated bike paths and cycling routes nearby.